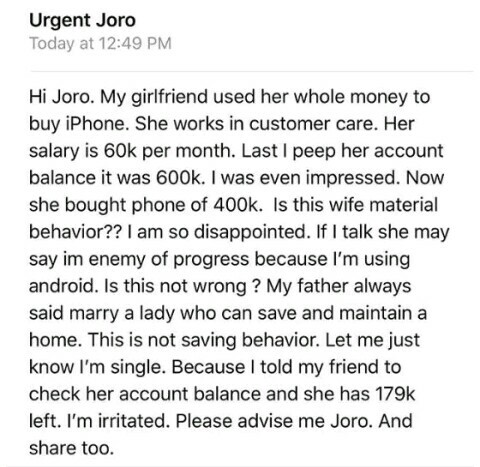 A young man has lamented about the lack of saving culture of his girlfriend who expended over 70% of the funds in her bank account on buying an iPhone. Relationship adviser and online psychologist, Joro Olumofin has shared the story of a young lady who earns a paltry sum of N60,000 per month but was able to cough out a whopping sum of N400,000 to buy an iPhone. Her boyfriend is making considerations about leaving the relationship due to her high-spending nature.